Shoulder impingement is somewhat of a global term to describe problems with the rotator cuff. In the past, people with this type of problem were often given a diagnosis of “tendinitis” or “bursitis.” There are several types of shoulder impingement, and this post focuses on subacromial rotator cuff impingement. I discuss internal impingement, another common source of shoulder pain, especially in overhead athletes, in another post. The rotator cuff is a series of muscles that come off the shoulder blade that form tendons that travel under the acromion (the tip of the shoulder blade) to insert on the humeral head. 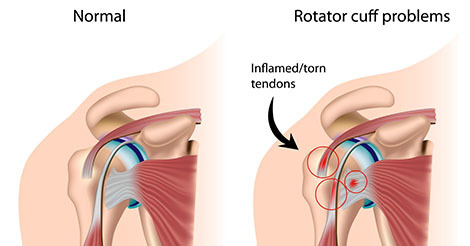 Problems with the rotator cuff can range from Impingement on the acromion to a partial tear to a complete tear. In the case of shoulder impingement, the rotator cuff can get irritated as it rubs against the undersurface of the acromion. The bursa (the fluid–filled sac between the rotator cuff and the acromion) can get inflamed, causing shoulder pain. In addition, there can be some underlying tendinopathy, or area of intrinsic degeneration within the tendon, in one of the rotator cuff tendons. The overall constellation of problems creates a very painful shoulder. Athletes and other patients with shoulder impingement often complain of shoulder and upper arm pain. The pain is usually worse with activities. Specifically the patient will complain of pain with overhead activities, as well as pain reaching out away from the body or reaching behind the back. Often he or she will complain of pain that wakes him or her up at night. Examination by a sports medicine physician or shoulder surgeon can be helpful, as physical exam can help make the diagnosis. There are several impingement tests, which are examination maneuvers that put the shoulder in certain positions to recreate the symptoms, which can classically reproduce the pain. Rotator cuff strength testing can rule out a full rotator cuff tear. Occasionally the physician will inject lidocaine, a numbing medicine, into the space between the rotator cuff and the acromion to see if the pain goes away. X-rays are usually taken. Occasionally these x-rays will show bone spurs or a sloping of the acromion which can cause pressure on the rotator cuff. If there is a concern for a full-thickness rotator cuff tear, an MRI might be performed. Treatment of rotator cuff impingement is, at least initially, nonsurgical. Rest from offending activities, ice, and anti-inflammatory medications can be helpful. Physical therapy can be very helpful, if not critical, to relieve the patient’s symptoms. Typically these are low-weight, high-repetition exercises in a variety of different positions to strengthen the rotator cuff and the surrounding muscles of the shoulder and upper back. Occasionally a cortisone shot into the subacromial space between the rotator cuff and the acromion can be helpful to augment the improvement produced with the physical therapy exercises. When could you need surgery? Occasionally shoulder surgery is needed as a last resort when the symptoms are not improving with nonsurgical treatment. Surgery usually entails arthroscopically looking at the rotator cuff, the subacromial bursa, and the undersurface of the acromion. The bursa is usually removed with an arthroscopic shaver, and the acromion is usually smoothed down with a burr to create space between the rotator cuff tendon and the acromion. With the scope, the surgeon looks throughout the shoulder to identify any other potential sources of pain as well. Rehabilitation after surgery involves aggressive physical therapy to improve range of motion and strength of the shoulder. Overall recovery can take several months, but the athlete can usually get back to full activity and sports, even throwing and overhead sports.